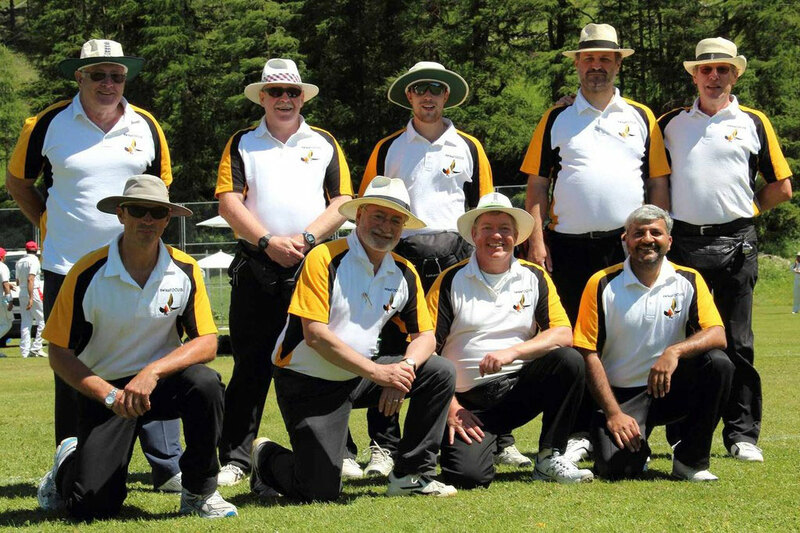 Milan CC finished eventual winners of the 2012 Annual International Cricket Festival in Zuoz that took place over two days in perfect cricketing weather & conditions in the Swiss alpine region of Engadine (GR) at 1800m in Zuoz. This was Milan's fifth Zuoz final in fifteen years, but their first victory: a well deserved win over runners-up Schmock (Holland) CC. Teams & officials were accommodated by the hosts, the Lyceum-Alpinum, at the school and local hotels, and a superb buffet lunch was supplied for the eight teams, officials and numerous guests & spectators on both days. Teams & officials arrived on Friday evening and immediately went to work familiarising themselves with the facilities and acclimatising themselves to the altitude, while in the evening the organisers & officials (five from the Swiss Federation Of Cricket Umpires & Scorers and three guests from the Belgium league) held an officials' meeting at the Hotel Klarer to deliberate & agree the tournament rules & regulations. The Saturday began with the tournament draw at 9.30am. Eight teams and the pitch allocation were decided before the teams went to work to decide the 2012 champions. The officials had already been allocated their pitch the previous evening so after the toss the first of three rounds of four simultaneous matches begain at 10am prompt. After the first round of matches the winners went into pool one to decide 1st to 4th place, while the losers of match one went into a second pool to decide 5th to 8th place. 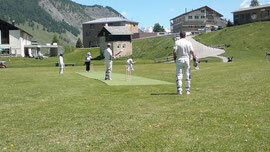 After some good, on occasions excellent, cricket, and a fine between innings lunch, the hosts Lyceum-Alpinum, Milan CC, Schmock (Holland) and Tegernsee were entered into pool one after winning their first round matches, while Geneva XI Stars, the Swiss Colts, last years winners Idle (Lodi) CC and Munich were entered into the second pool. The second round of matches got underway with the sun still shining, but now with the cold, dry Malloya wind blowing through the valley. A dangerous combination, making suncreen & sunblock a necessity, in particular for the fair skinned! Schmock (Munich) CC and Milan CC won the pool one games to reserve their places in the final on Sunday morning, while Munich and Geneva XI Stars were set to battle it out for the 2012 wooden spoon after losing their second pool two games. At 9.30am on Sunday morning teams & officials congregated at the ground one again for the second day and the final round of matches to decide the eventual tournament rankings. swissFOCUS officials Mr. Alex Mackay & Mr. Shahzad Muzaffar had the honour of standing in the final between Milan CC and Schmock (Munich) CC that started at 10.30am, while the other matches began at 10am. In his closing speech, Mr. Mark Jones, thanked all the teams, everyone involved in the organistation of the event and of course the umpires. Mark Jones, who will be leaving the school at the end of this summer term said, "Together we have taken this tournament to a new level". 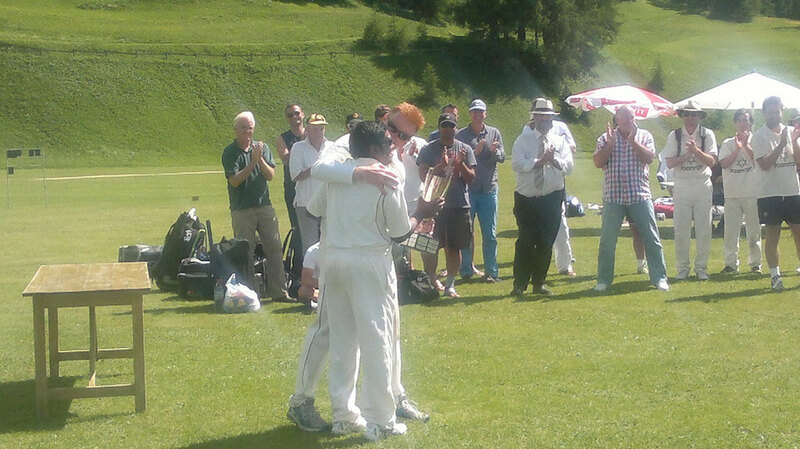 More information is available from Alex Mackay (SCA) or Mark Jones (Zuoz), and there articles available on last year's tournament on the website and the Lyceum Alpinum's cricket blogspot. Clive Denney (Switzerland); Andrew Scott (Belgium); Richard Black (Belgium); Peter De Boeck (Belgium); Alex Mackay (Switzerland); Paul Cawsey (Switzerland); Ian Bond (Switzerland); John McKillop (Switzerland); Alex Mackay (Switzerland); Shahzad Muzaffar (Switzerland).